Today, at 6:30pm Eastern Time, Microsoft is planning to make a “big update” regarding its backwards compatibility program on the Xbox One. 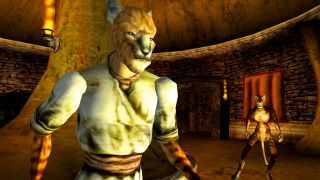 Luckily for us, it looks like that big update has already manifested itself on the Xbox Marketplace, as a number of original Xbox games have surfaced onto the store with a new option for backwards compatibility. Microsoft’s announcement later today will probably specify the entire list of original Xbox games now playable on your Xbox One as a result of the update, but many are already live as listings, ready to enjoy on your console so long as you own the original disc or the digital edition from the online store. Here’s a run down of the best new original Xbox games that are now backwards compatible thanks to today’s impending update. Considered by many as the best Elder Scrolls game in the history of the franchise so far, Morrowind’s newfound backwards compatibility is probably the biggest news to come out of this update so far, and it’s a great way to rediscover Tamriel’s northeastern gem. Better yet, the game’s visuals have been rejigged for the Xbox One X, with raised resolutions and anisotropic filtering to breathe some life into the 16 year old engine. An RPG classic, and a great way to pass the time while you wait for The Elder Scrolls 6. Essentially Grand Theft Auto, but you’re an alien, and it’s the 1950’s, so everyone’s a hippy. What that means for you is a grand old time living up to the game’s namesake by taking out humanity with whatever alien tech is at your disposal, including telekinesis, death rays, and a bona fide flying saucer. The game's hokey script isn’t as funny as the high-concept mayhem you’ll pull off by yourself, but it’s certainly in keeping with one of the maddest, wackiest games that the noughties ever produced. Remember when motorbike games were fun? Like, really, really fun? MX Unleashed is here to remind you, as its now available on Xbox One as the latest backwards compatibility title in the arcade sports genre. The graphics are smooth as butter, the controls are airtight, the comprehensive career mode is unmatched, and the soundtrack is, like, totally gnarly, man. As a purist racing experience with few gameplay snags, it doesn’t get much better than Unleashed. Hyper realistic RTS mil-sims are usually left to the realm of PC gaming, but Full Spectrum Warrior made no compromises in its transition to console back in 2004. Fans of Battlefield and X-COM will definitely enjoy the game’s focus on squad play, and there’s even a co-op mode that lets two players work together with each of their own individually commanded units. The modern warfare aesthetic might feel a little dated in 2018, but absolutely give this a shot if PlayerUnknown’s Battlegrounds and Rainbow Six: Siege have left you aching for more tactically focused firefights. That’s all the new original Xbox game listings that have been found on Microsoft's Marketplace so far, but more are likely to turn up and be found throughout the day, so keep your eyes peeled on this list for more recommendations as they come out. For now, why not just check out the best Xbox One games out there, while you wait for your old favs.